for Excellence in Historical Recorded Sound Research. The Moody Blues have sold over 80 million records, and scored Top 20 hits in four different decades. They hit the top in 1965, with a No. 1 single, “Go Now!”, and toured with the Beatles (both bands managed by Brian Epstein). But their true breakthrough came in November 1967 with the release of the classic Days of Future Passed, the first LP to combine the rock album format with orchestral music, and spawning another No. 1 single: “Nights in White Satin.” Overnight, the new genre of “symphonic rock” was born. Advancing this further, Moody Blues founding member Mike Pinder helped develop the Mellotron, a keyboard instrument which could simulate the sound of a string orchestra. This innovation not only gave the Moodies their unique sound, but enabled them to reproduce their epic albums in concert. The Moodies were also the first rock group to champion the “concept album,” following Days of Future Passed with other thematic classics, such as In Search of the Lost Chord; On the Threshold of a Dream; To Our Children’s Children’s Children; A Question of Balance; and Long Distance Voyager. 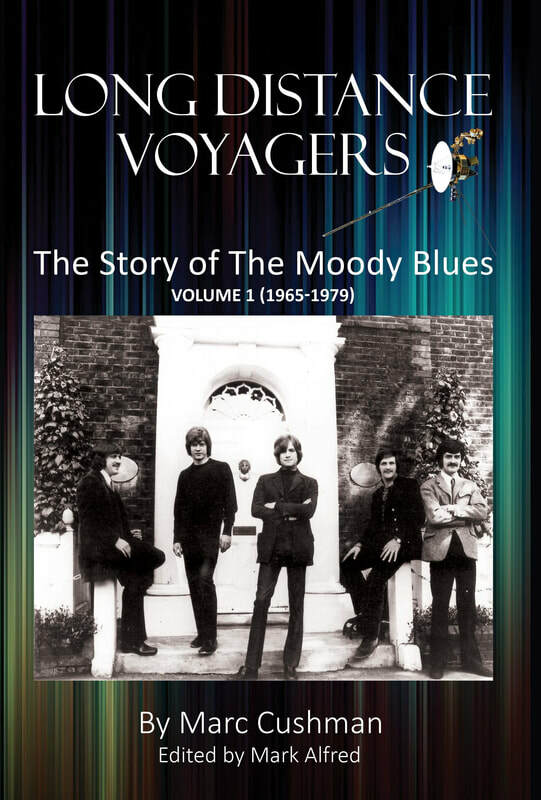 This in-depth biography covers the magnificent 50-plus-year career of the Moody Blues (in two volumes). Exhaustively researched and featuring thousands of vintage interviews, reviews, and record chart statistics, as well as hundreds of photos. Long Distance Voyagers: The Story of the Moody Blue will whisk you back in time and put you on the very threshold of a dream. Remarkably, until now there has been no proper book on the Moodies. The present volume, which on its release shot to #1 in Amazon’s “Music History & Criticism” Category, has remedied the omission. This meticulously researched book is over 800 pages with hundreds of photos and interviews. This is a beautifully bound, hardcover book with dust jacket and a matching bookmarker when purchased through our website. DOES NOT include a matching bookmarker.